Amaranthus Love Lies Bleeding Red Amaranthus Caudatus is a spectacular, bushy, half-hardy annual native to India, Africa and Peru. Also called Tassel Flower, this old-fashioned, favorite garden annual can be easily established from Amaranthus seeds. 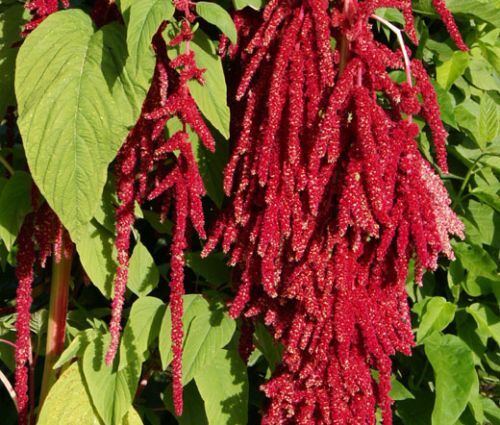 Love Lies Bleeding is one of the most unusual garden flowers, and this plant gets the common name from its fascinating, small, crimson or purple, petalless blooms that apppear in cascading tassels. Amaranthus Caudatus features foliage with medium green, almost tropical-looking leaves that turn bronze during the season. Amaranthus is used in cottage gardens, borders, containers, and pots. The botanical name of Amaranthus comes from the Greek word for unfading, and Love Lies Bleeding is a long lasting fresh cut flower that retains its color for a considerable time and can be used for dried floral arrangements.